Star Wars has transcended to different mediums of storytelling in canon. One of those mediums is comic books. Star Wars comic books have been around since the beginning, but there was always a level of disconnect to the movies. Lucasfilm announced back in 2014 (here) that everything moving forward would hold the same canonicity. Now that there is a huge increase in people wanting to purchase comics it becomes evident that it may be an overwhelming experience. The purpose of this guide is to help introduce you to the Marvel canon comics, and what method you might want to collect them. One-shot: Comic that is only one issue long. Miniseries: Comic series that is approximately 4 to 6 issues long. Ongoing: Comic series that has no definite ending, when starting out. Issue: A segment of a comic story that is sold individually. Annual: Ongoing series might have a special yearly issue that is separate from the main story. It is larger in size, and will occasionally lead into the next arc. Trade Paperback: Collection of about 5 to 6 issues of a comic in a graphic novel style format. Hardcover: Collection of about 12 issues of a comic in a graphic novel style format. Omnibus: Collection of 12 issues or more of a comic in a graphic novel style format. I do want to warn that release dates do shuffle a lot in the business. When it comes to buying comics the general rule of thumb is the sooner you want to read the story, more you will have to pay. If you are on a budget it can be beneficial to hold off until the trade paperback (TPB) as it is not only cheaper, but can be displayed better on the bookshelf. The downside to waiting on the TPB is not only time waiting to read the story, but it can affect the ongoing comic series. It is no secret that sales of individual issues drive the longevity of a particular series. If not enough people are buying an ongoing it may end prematurely. 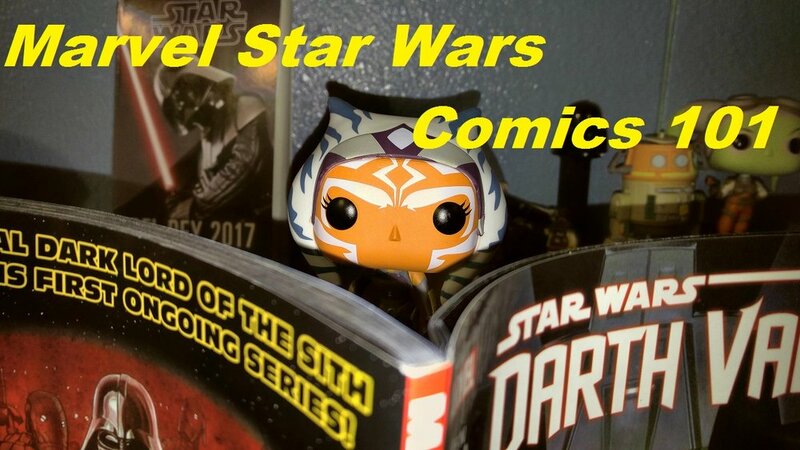 The good news about Marvel Star Wars comics are most of their comics are miniseries, so you shouldn't worry too much. There are multiple ways to collect a comics. For physical comics you could buy the issues of a series individually by purchasing the regular version or a variant. Variants have the same story, but have a different cover. Prices can skyrocket on variant covers, so that is not always an option to budget consumers. A benefit to buying individual physical issues is they do include a digital copy of other Marvel comics. Originally, the digital comic was the same as the issue one bought of the physical. This has changed to a mystery box system, where the digital comic is from another Marvel series to encourage you to explore other properties. For digital comics you buy them from either Marvel, Googleplay, Amazon, etc and they can be read in either the Marvel comic app or your eBook reader app of choice. The prices are similar to the physical issues; however, there might be promotions that happen every so often. The benefit to purchasing digital is all the comics are stored by your account, which can be accessed by smartphone, tablet, etc. This can be handy, when you have unexpected spare time to jump into a comic book. The downside is the inability to trade, with friends. Marvel Star Wars comics have been insanely busy since they took over the reigns from Dark Horse. So much so that I will write a separate guide on the miniseries and ongoings. If you are looking to catch up, and don't mind a subscription service, then Marvel Unlimited (found here) is a great option! The service is about ten bucks a month. You gain access to Marvel’s humongous catalog of comics, and they allow you to cancel anytime. There is a six month delay on new comics, but they are updating all the time. While you are using Marvel Unlimited if you do enjoy a particular miniseries, ongoing, or issue I strongly suggest purchasing it. This not only supports the artists, it is how Marvel decides where to focus next. You could also express feedback to Marvel directly, but keep in mind it has limitations. More times than not the people making the comics must rely on their instincts and experience to tell a good story. The most powerful influencer is buying a comic. This is most important to ongoing series, because they are the most affected by lack of single issue sales. Comics have been known to be absurdly flexible, when it comes to working within a timeline. By flexible it I mean the timeline is not something always mapped out. You must have a suspension of disbelief that a billion stories took place in a short span of time, and that it all happened. However, in Star Wars the timeline is more set in stone. How Marvel has been mapping out their stories in Star Wars is to not get specific on time unless it is vital to the story. This allows them to tell great stories, and not trample on future stories. Because of the flexibility on the stories fans have tried reaching out to authors, editors, etc looking to set in stone events. I have even done so! However, that will only get you so far. Only the Lucasfilm Story Group is in charge, with approving exact placement of stories, and they don't want to limit a future story. You can still ask, but keep in mind it will never be definitive unless set in stone by the story itself. In addition, always remember to be nice! Everyone works so hard to create wonderful stories in breakneck speed. Now that you have figured out how you want to buy, I will part you with a comic recommendation! The Star Wars: Han Solo miniseries (found here) written by Marjorie Liu, art by Mark Brooks, and colors by Sonia Oback. Dexter Vines (ink) and Matt Milla (color) contribute on select issues. This story and art is so beautiful! Set some time between Heir to the Jedi and Empire Strikes Back, Han Solo and Chewbacca get talked into a secret mission by Princess Leia, which leads them to a dangerous race! The story is built up to a wonderful character moment that will leave you wanting more! The story also connects wonderfully, with “Scorched” by Delilah S. Dawson (found here), Bloodline by Claudia Gray, and The Force Awakens movie!